Editors note, 30 -11-2014: this new post needs additional work, but is presented here for the sake of the new pictures and to promote further discussion and information. Please bear with us while changes are being considered and carried out. Updated 15(2)-01-2015. 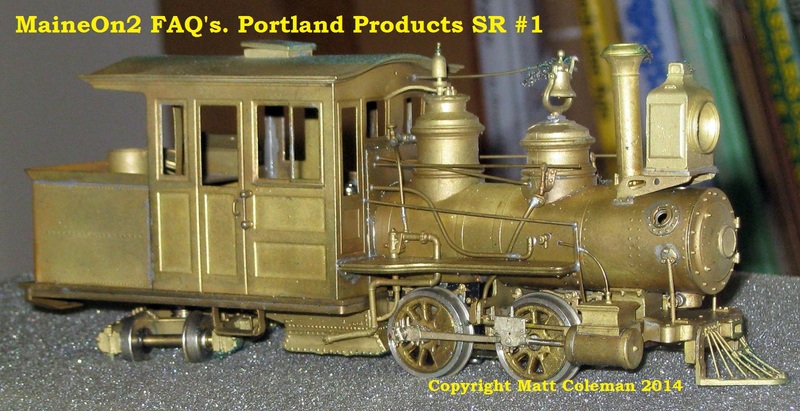 And the red Portland Products box………..
Sandy River #1 Dawn (1879 – 1890) rebuilt as a conventional boiler first locomotive. Rebuilt in 1882 with longer wheelbase, larger cab and water tank. Sandy River & Rangeley Lakes #1 (1908 – 1912). 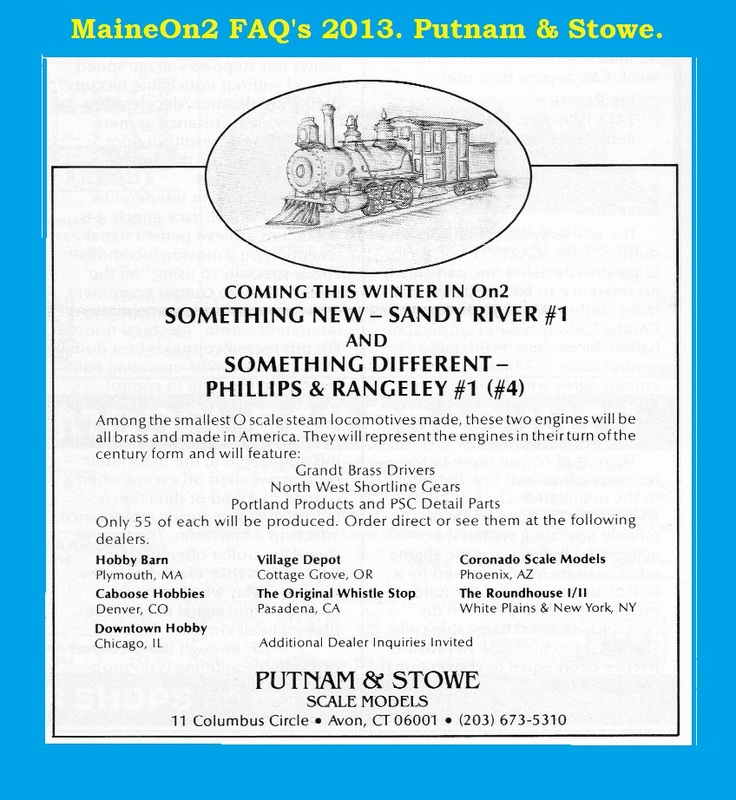 Putnam & Stowe bravely announced their intentions of making brass On2 models domestically within the US with the advert below placed in the November/December 1983 edition of the NG&SL Gazette. 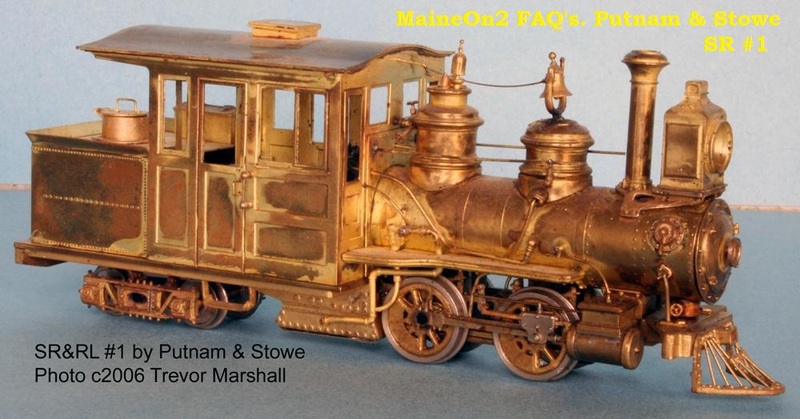 The models offered represented a rebuilt version the smallest Hinkley made locomotive (original weight 12 tons) used on the Maine Two Footers and had a good specification consisting of driver centres supplied by Grandt Line, gears and a Sagami can motor from NWSL and detail parts from Portland Products and Precision Scale Models. 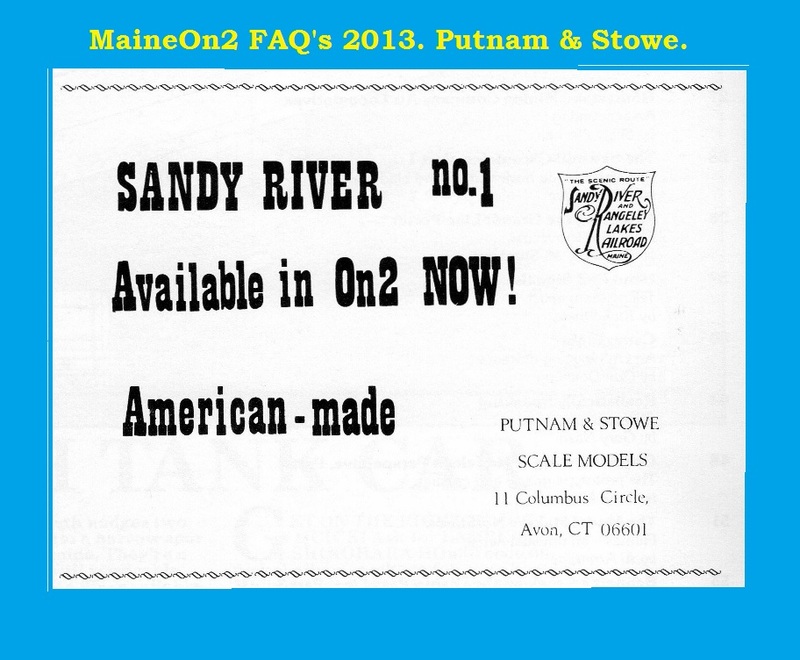 Note that the models finally offered were sold as Sandy River #1 and Sandy River #2. 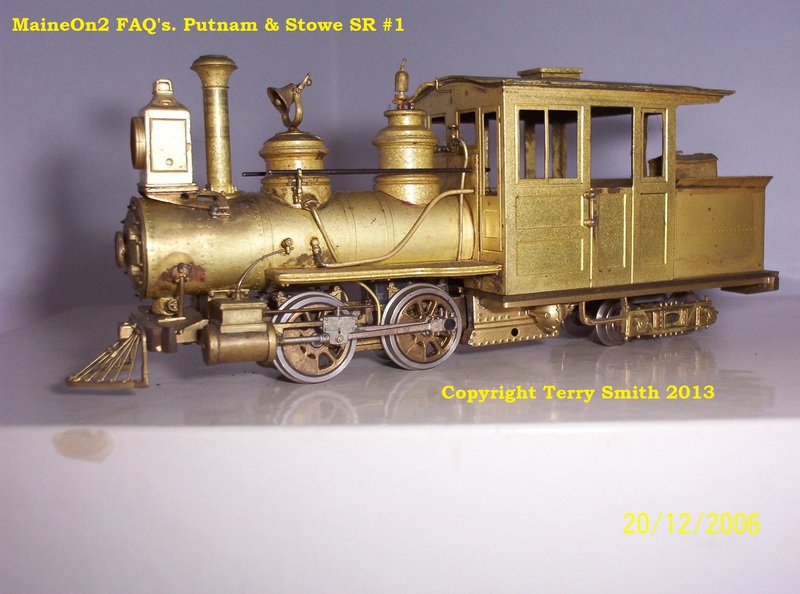 The model detailing represents these locomotives around the 1900 time period. 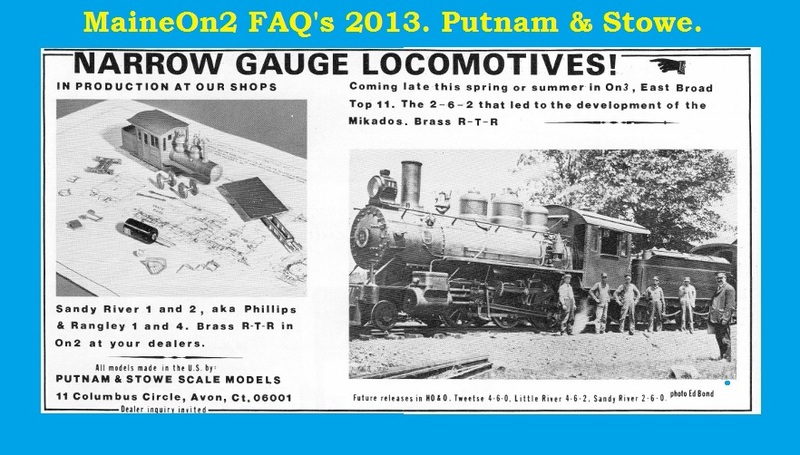 The story of Putnam & Stowe is interesting, but the venture was not successful. The models quickly suffered from a reputation for “variable build quality”, which hit sales. A number of these models have been re-built by skilled modellers, such as Chester Louis. To see more of Chester Louis’s rebuild. 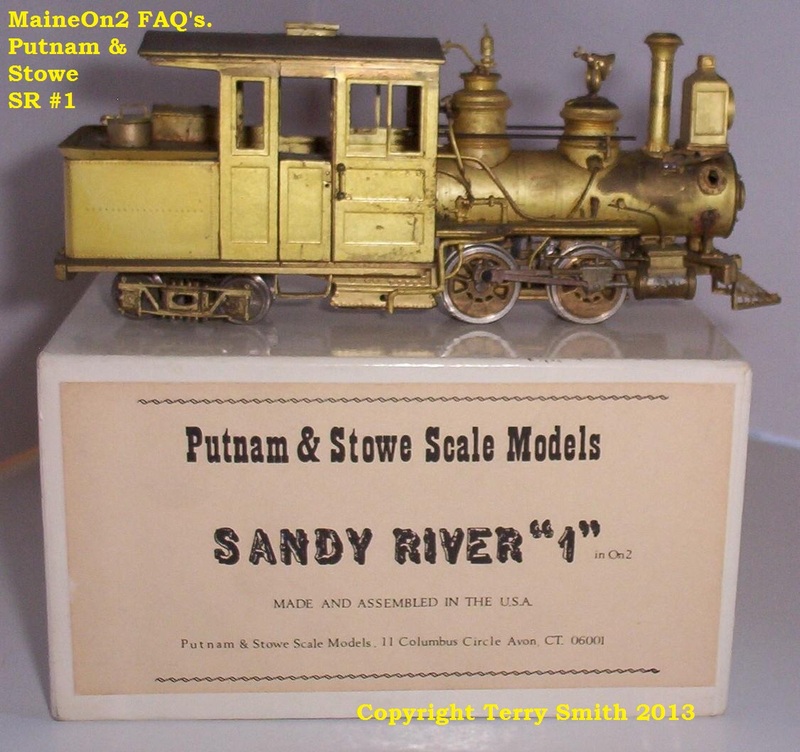 To see more of the Sandy River #1 model. To see more of the Sandy River #2 model. 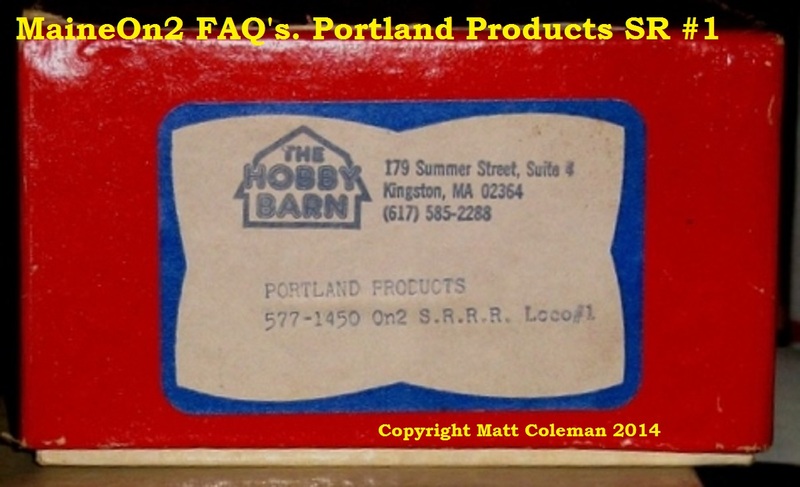 The name Putnam & Stowe came from Maynard’s immediate family, and was suggested by Bob Werner of The Hobby Barn and Portland Products as having a very “New Englandy” sound. Maynard continues; pretty much all the suppliers were generous to work with, and I learned a lot about making a low volume production line work which I put to use in a business that I ran with my brother until I sold it and retired in 2008. The Sandy River On2 engines were a sort of collaboration with Bob Werner through some of his resources. Russ Briggs did the drawings for the photo etching for the boiler, cab and rear tank, and Bob did the detail parts for the domes, running boards, steam ejector for the brakes, rear truck, cylinders, connecting rods and cross heads. Cliff Grandt cast the drivers and another contractor on the west coast did the tires, insulation and wheel assembly, shipping them to me ready to go. I did the frames, pilot deck, toolbox and some other parts. 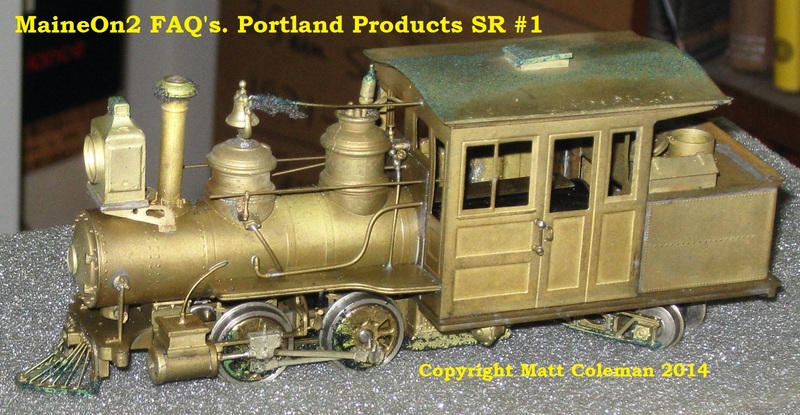 The square headlight used on the SRR #1 was an Sn3 part from Tomalco, and the bell might have been from The Backshop or PSC. The cab roof was built up using 3 slightly different sized etchings with the center vent square used as the locating feature. The pagoda curve was done in a maple wood form made by my brother and getting the 3 pieces soldered together involved a lot of clamping and learning not to release the clamps until the parts were comfortably cool. I don’t really have any records of how many of the SRR #1 or #2 locomotives were produced, but I know that there were more #1’s (about 35 to 40 engines) than #2’s (maybe 20- 25 engines). As for the kits: They were made from the left over parts that were not built into the run. I had total parts for around 100 engines. 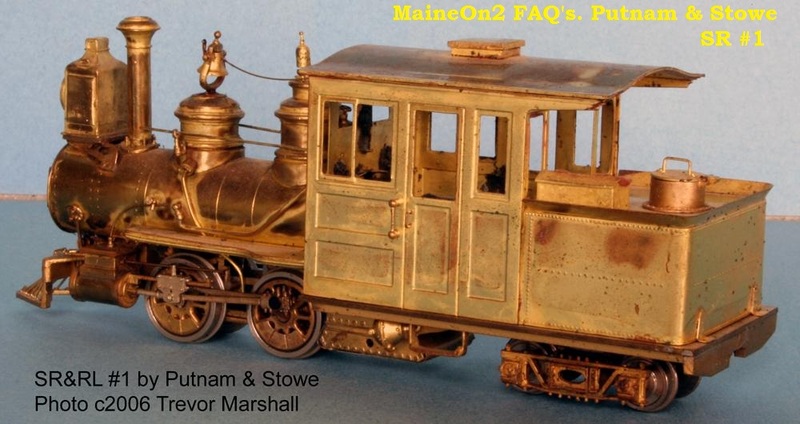 When I got out of the building business, I sold all the remaining engines and several collections I had picked up to Armand Mazzetti of The Caboose in Walcott, Connecticut. 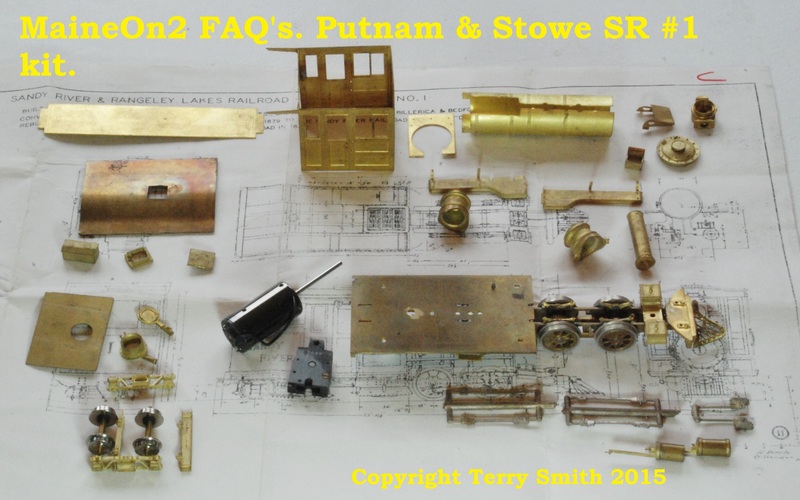 Armand was one of the major brass model dealers in the US with a world wide clientele, and he suggested that I turn the remaining castings and etchings and motors/gearboxes into kits. I did and made about twenty of them before I ran out of parts. All the kits were sold by Armand at train shows and out of his shop. This model generally requires a 26″ minimum radius for satisfactory operation. A broadside view of the chassis and drive arrangements. 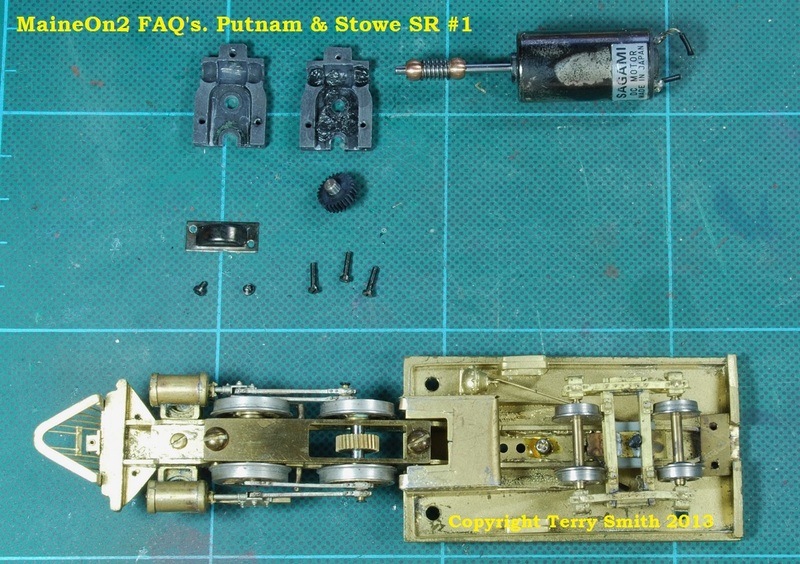 This view shows a brass flywheel has been added (inside the cab) by moving the worm forwards along the shaft and moving the motor backwards on the chassis. Note that the extended motor shaft is still fully engaged with the phosphor bronze self aligning bearing in the gearbox, but does not protrude from the front of the gearcase. A view of the dismantled drive arrangements. Also visible is the rear truck pivot arrangement which on this engine is currently not centred on the truck. Note this particular model has no engineered arrangements for sideways displacement of the rear truck, however it does run around Precision Scale flex track accurately curved to 48″ radius without problems. A small number of kits were produced at the end of the main build program. 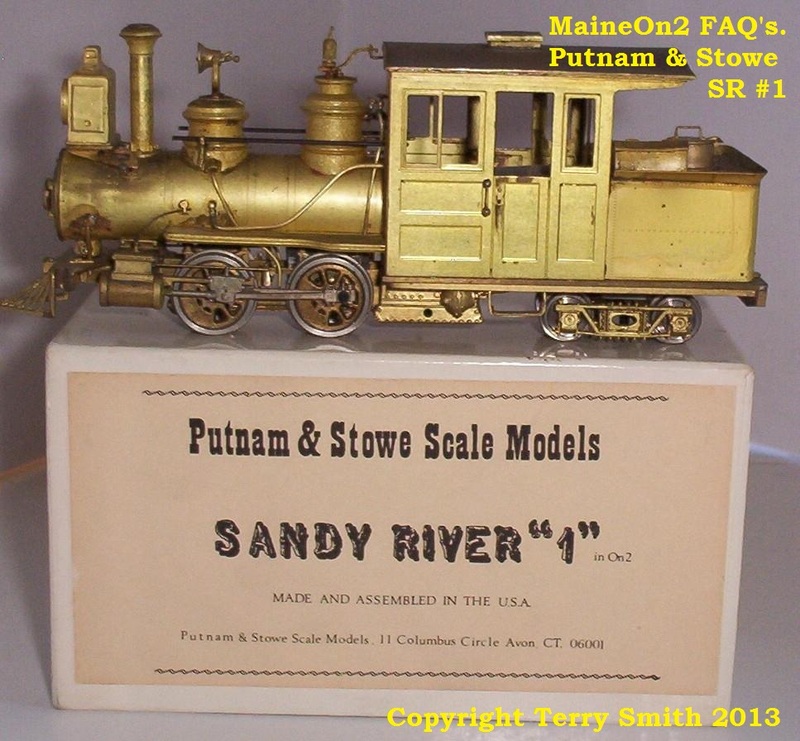 See Putnam & Stowe – Sandy River locomotive #2 for a picture of the main components of a kit. For more information about the Putnam & Stowe operation click here. 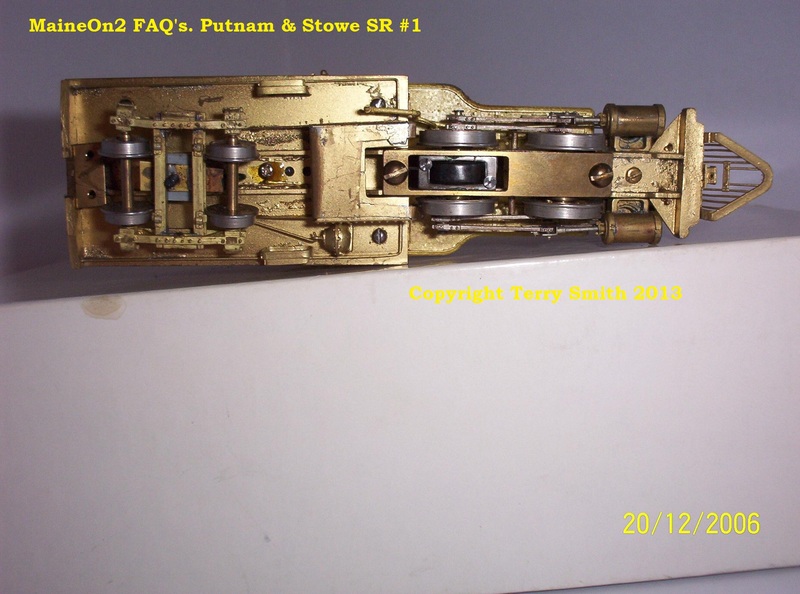 Putnam & Stowe model locomotive #1 curvature, grade and haulage capability tests performed by Ed Kozlowsky. Ed performed these tests to evaluate the capabilities of small On2 engines that he had acquired in order to determine whether any of the original HO bench work then in use could be salvaged for use in On2, in particular a 24″ radius helix with a 2.7% rise. Ed’s existing bench work and space constraints meant that the conventional published “wisdom” of “needing at least 36″ radius because of the stiff Forney’s needed a reality check. 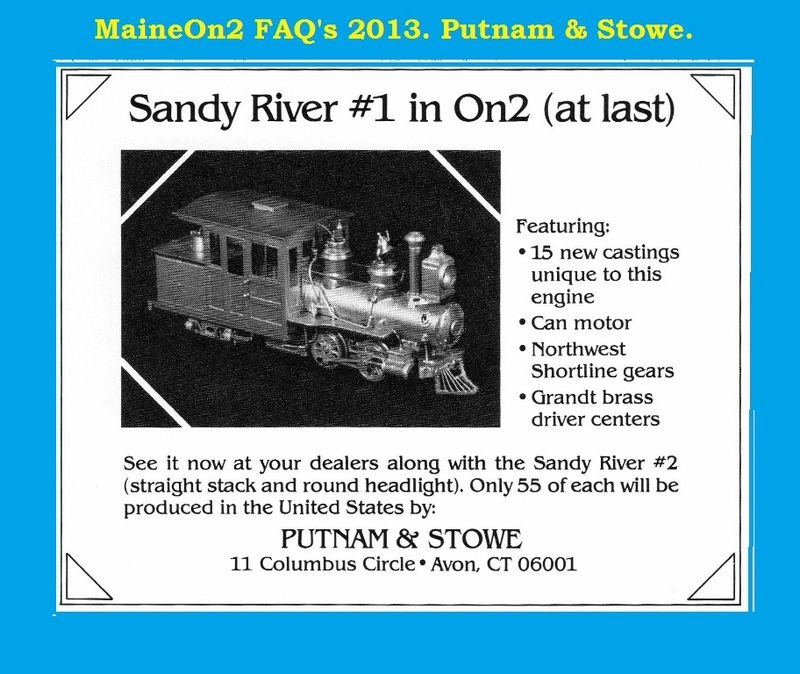 The test subject was a Putnam & Stowe Sandy River #1. Ed balanced the engine so that both drivers were loaded as equally as possible by adjusting the spring over the rear truck. Before this, one driver definitely had more weight on it than the other. Note that there is a slot in the truck bolster allowing the truck to swing sideways. 1. Laid out a 24″ radius curve on a level table using Precision Scale Company code 70 flex. The Forney had no problem in either direction. 2. Added one 24′ and one 28′ box car. No problem in either direction in the curve or transitioning with no easement. 3. Using double sided tape, I placed 3 sections of flex track on the helix starting from straight with no easement to full 24″ curve. No joints were soldered, so some kinking at the joints was inevitable. Forney ran without mishap upgrade boiler first and tender first. 4. I added the 28′ car next to the engine and the 24′ car after. Boiler first there was no derailment or problems. 5. I then switched the order of the cars without mishap. 6. Here is where I expected if there was going to be a problem it would show up, tender first pushing the cars upgrade. My thought was that the wide swing of the coupler would push the engine sideways enough to derail her. Surely she would catch on one of the imperfections of the rail joints and derail. I watched closely as the little Forney negotiated the helix without so much as a hint of trouble. I did it over and over again on different days with different cars all with the same results. 7. I’ve experimented with #5 turnouts with the same results. 8. Trying different combinations of cars, the most I could haul up the grade was 2 box cars and 3 flats. I wasn’t really happy with that. 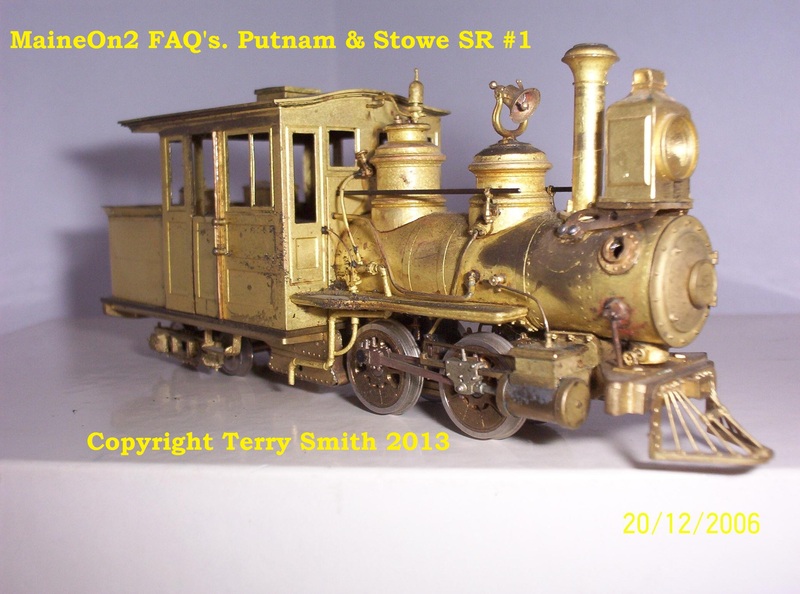 I have nothing but these little engines (Putnam & Stowe Forney’s), so I don’t know how larger ones would perform, but I don’t plan on running anything larger anyway. Also, I have no interest in running long passenger cars. For the operation I am planning, a short car or caboose fitted with seats will suffice. If I do want to run something longer in the future, I’ll buy one and figure out how to make it work. It’s impossible to be a model railroader without making compromises.